The Verve were an English rock band formed in Wigan in 1990 by lead vocalist Richard Ashcroft, guitarist Nick McCabe, bass guitarist Simon Jones and drummer Peter Salisbury. Guitarist and keyboard player Simon Tong became a member at a later date. The founding members of the Verve met at Winstanley Sixth Form College, in Wigan, Greater Manchester. The band was initially known as just "Verve", and their first gig was at a friend's 18th birthday party at the Honeysuckle Pub, in Wigan, on 15 August 1990. Most of the band's early material was created through extensive jam sessions. Fronted by singer Richard Ashcroft, the band caused a buzz in early 1991 for its ability to captivate audiences with its musical textures and avant-garde sensibilities. The group was signed by Hut Records in 1991 and their first studio releases in 1992, "All in the Mind", "She's a Superstar", and "Gravity Grave" (along with the December 1992 EP Verve) saw the band become a critical success, making an impression with freeform guitar work by McCabe and unpredictable vocals by Ashcroft. Those first 3 singles reached the first spot in the UK Indie charts, and "She's a Superstar" entered the UK Top 75 Singles Chart. The band saw some support from these early days in the United States in some music scenes in big cities like New York connected with psychedelic music. 1993's A Storm in Heaven was the band's full-length debut, produced by record producer John Leckie (of Simple Minds, Radiohead, The Stone Roses, XTC and The Fall fame). "Blue" was released as the lead single and again managed to enter in the UK Top 75 at No. 69 and reached No. 2 in the Indie charts. The album was a critical success, but was only a moderate commercial success, reaching No. 27 in the UK album chart that summer. The second single from the album, "Slide Away", topped the UK indie rock charts. During this period the band played a number of gigs with Oasis who, at the time, were relatively unknown. In 1994, the band released the album No Come Down, a compilation of b-sides plus a live version of "Gravity Grave" performed at Glastonbury Festival in 1993. It was the band's first release under the name "The Verve", following legal difficulties with the jazz label Verve Records. The band then played on the travelling U.S. alternative rock festival, Lollapalooza, in the summer of 1994. A new mix of "Blue" was released in the U.S. to promote the band. The tour became notorious for the events of 11 July – Ashcroft was hospitalised for dehydration after a massive session of drinking, and Salisbury was arrested for destroying a hotel room in Kansas in a drug-fuelled delirium. However, the band were performing again the very next day. Ashcroft later recalled: "At the start, it was an adventure, but America nearly killed us." The band's physical and mental turmoil continued into the chaotic recording sessions of the band's second album, 1995's A Northern Soul, produced by Owen Morris. The band departed from the experimental psychedelic sounds of A Storm in Heaven and focused more on conventional alternative rock, with Ashcroft's vocals taking a more prominent role in the songs, although reminiscent of some of the early work. Around this period, Oasis guitarist and friend of Ashcroft, Noel Gallagher, dedicated the song "Cast No Shadow" on the album (What's the Story) Morning Glory? to Ashcroft, and Ashcroft returned the gesture by dedicating the song "A Northern Soul" to Noel. Ashcroft reunited with Jones and Salisbury just a few weeks after the break-up, but McCabe did not rejoin them. The new band hired former Suede guitarist Bernard Butler, but he spent only a couple of days with the band. The band then chose Simon Tong, a school friend credited with originally teaching Ashcroft and Jones to play guitar. The band made no live appearances for all of 1996, apart from a solo performance from Ashcroft supporting Oasis in New York. The rest of the year was spent playing and recording songs for a new album. In early 1997, Ashcroft decided to ask McCabe to return, stating: "I got to the point where nothing other than The Verve would do for me". McCabe obliged and with the original line-up back together (Tong remained on guitar alongside McCabe), the group went through a "spiritual" recording process to finish their third album Urban Hymns which was completed by early summer. The lead track on their album, Urban Hymns, "Bitter Sweet Symphony" is renowned for its signature swirling orchestral melody. For the first time in their career, the Verve experienced widespread commercial success with their new material. The album's first single "Bitter Sweet Symphony" entered the UK charts at number 2 in June 1997, but the song's success was marred by legal problems regarding ownership of the song. Even though the group had secured permission to use a sample of 4 bars of an orchestral rendition of "The Last Time" by The Rolling Stones, it was successfully argued that the group had relied too heavily on the song's original vocal melody as well, and they were forced to surrender copyright and royalties to Mick Jagger and Keith Richards. The music video for "Bitter Sweet Symphony", which received heavy rotation on MTV, focuses on Ashcroft lip-synching the song while walking down a busy London pavement, oblivious to what is going on around and refusing to change his stride or direction throughout. In August 1997, the band began playing their first gigs in two years, beginning the Urban Hymns Tour. The next single, "The Drugs Don't Work" gave the band their first UK number 1 single in September. The album immediately reached number 1 on the charts later that month, knocking off Oasis' highly anticipated album Be Here Now in the process. The band saw an overwhelming increase in popularity overseas, and "Bitter Sweet Symphony" reached number 12 on the U.S. charts, the band's highest ever American position. The album reached the US Top 30, going platinum in the process. Critic Mike Gee of iZINE said of this time, "The Verve, as he (Richard Ashcroft) promised, had become the greatest band in the world. ...The Verve were no longer the question mark or the cliché. They were the statement and the definition." By November the band released "Lucky Man" in the UK and reached number 7. At the 1998 Brit Awards in February, the Verve won the awards for Best British Group and Best British Album (Urban Hymns). The band's singles were given extensive airplay on US rock stations and Ashcroft, and band mates, appeared on the cover of Rolling Stone magazine in March 1998. Then, as the band was on a successful tour to promote the album, Jones collapsed on stage. This was the first of many problems to come for the band in the next months. 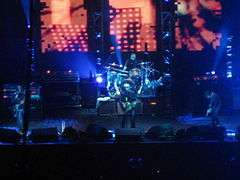 In 1998, McCabe, Tong, Jones and drummer Leon Parr formerly with Mr. So & So and Mosque were commissioned for a soundtrack for a Jonny Lee Miller film which was recorded in Kilburn. These never made it to the final film due to delays on their part. At the 1998 MTV Video Music Awards, "Bitter Sweet Symphony" was nominated for Video of the Year, Best Group Video, and Best Alternative Video. On 24 May of that year, the band played a homecoming concert in front of 33,000 fans in the grounds of Haigh Hall & Country Park, Aspull, supported by Beck and John Martyn. The band then played gigs in mainland Europe. However, on 7 June a post-show bust-up at Düsseldorf-Philipshalle left McCabe with a broken hand and Ashcroft with a sore jaw. After this, McCabe decided he could not tolerate the pressures of life on the road any longer and pulled out of the tour, leaving the band's future in jeopardy, with rumours of a split circulating in the press. Despite this, the band continued with established session guitarist B. J. Cole replacing McCabe. McCabe's guitar work was heavily sampled and triggered on stage. The band played another American tour, which was riddled with problems as venues were downsized and the support act Massive Attack dropped out. The band then returned to England for two headline performances at the V Festivals, which received poor reviews, with NME stating "where songs used to spiral upwards and outwards, they now simply fizzle tamely." In February 1999, "Bitter Sweet Symphony" was nominated for the Grammy Award for Best Rock Song. The Verve played their last gig at Slane Castle in Ireland on 29 August. A long period of inactivity followed. Finally, in April 1999, it was announced that the Verve had split up. By the time the band had split, Ashcroft had already been working on solo material accompanied by, among others, Salisbury and Cole. In 2000, he released his first solo album, Alone with Everybody, which reached number 1 in the UK album charts. Ashcroft's next album Human Conditions was released to poorer sales in 2002, and Ashcroft was subsequently absent from the music business for several years. During this time Salisbury was the drummer for Black Rebel Motorcycle Club's UK tour in 2004, after their original drummer briefly left due to alcohol and drug abuse. Salisbury also owns a drum shop in Stockport. Ashcroft appeared with Coldplay at Live 8 in 2005, followed by the release of Keys to the World in 2006 and a particularly successful tour that included gigs as the support act for Coldplay's Twisted Logic Tour. Tong and Jones formed a new group called The Shining, which initially included former Stone Roses guitarist John Squire; however Squire left the band before recording and touring had begun. The band released one album, True Skies, before disbanding in 2003. Jones went on to join the band of Irish artist Cathy Davey. Tong appeared as a live replacement for ex-guitarist Graham Coxon in Blur, and as additional guitarist for Gorillaz (both Jones and Tong played guitar for Demon Days Live). Tong is also a member of an unnamed supergroup formed by Damon Albarn of Blur which released its first album The Good, the Bad & the Queen in January 2007. McCabe worked in different projects like the London-based Neotropic project and played with some established artists, including John Martyn, Leeds-based band The Music, The Beta Band and Faultline. The Verve performing in Greenwich, London on 13 December 2007. Ashcroft had been adamant that the Verve would not reform, once remarking: "You're more likely to get all four Beatles on stage". However, after Ashcroft learned that Salisbury was in contact with McCabe over a possible side project, Ashcroft contacted McCabe and Jones, making peace with them, and the band reformed. Tong was not asked to rejoin, so as to keep the internal issues that split the band up a decade ago to an absolute minimum. Jones explained this decision by stating: "It would have been too hard, it's hard enough for the four of us. If you bring more people to it, it's harder to communicate and communication has always been our difficulty". On 26 June 2007, the band's reunion was announced by Jo Whiley on BBC Radio 1. The band, reuniting in their original line-up, announced they would tour in November 2007, and release an album in 2008. The band stated: "We are getting back together for the joy of music", though they turned down a multi-album deal offer "because the 'treadmill' of releasing albums and touring marked the beginning of the end for the band a decade ago". 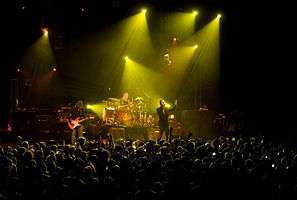 Tickets for their six-gig tour in early November 2007 sold out in less than 20 minutes. The tour began in Glasgow on 2 November, and included 6 performances at the Carling Academy Glasgow, The Empress Ballroom and the London Roundhouse. Since the 6-gig tour went extremely well in sales, the band booked a second, and bigger tour for December. They played at O2 arena, the SECC in Glasgow, the Odyssey in Belfast, the Nottingham Arena and Manchester Central. Each show from the first and second part of the tour were sold out immediately. The band continued touring in 2008. They played at most of the biggest summer festivals and a few headline shows all over North America, Europe, Japan and the UK between April and August. Including shows at the Coachella Valley Music and Arts Festival, also at the Madison Square Garden Theater, and the Pinkpop festival, Glastonbury Festival, T in the Park, the V Festival, Oxegen Festival, Rock Werchter, Rock am Ring and Rock im Park and The Eden Project Sessions. McCabe and Jones have since started their own project, The Black Ships, who later changed their name to Black Submarine, along with electric violinist and arranger Davide Rossi and drummer Mig Schillace. Nick McCabe says "The Verve seems to be on holiday" on his MySpace page. On 7 July 2010 Ashcroft confirmed that the band "is over for good", though some weeks later did not rule out another Verve reunion. Noel Gallagher of Oasis has covered "Bitter Sweet Symphony" on a few occasions, most recently on the 2006 Acoustic Stop The Clocks Tour. Also, the song "Cast No Shadow" was written as a homage to Richard Ashcroft, who in turn wrote "A Northern Soul" from the band's second album for Noel Gallagher. "Star Sail", the opening track of A Storm in Heaven, is featured in the 1993 film Sliver and is featured on the Virgin Records US release of the soundtrack. In 2009, "Bitter Sweet Symphony" was voted number # 14 in Triple Js Hottest 100 of all time. "One Day" and "The Drugs Don't Work" are played on BBC Two comedy-drama Home Time. Three Days Grace's Adam Gontier did an acoustic cover of "The Drugs Don't Work". In the 2015 Super Bowl, "Bittersweet Symphony" was the song to which the Seattle Seahawks's took the field. ↑ "Top 40 Best Selling Albums: 28 July 1956 – 14 June 2009" (PDF). Official Charts Company. Retrieved 26 July 2011. 1 2 "Rock band Verve announce reunion". BBC News. 26 June 2007. Retrieved 23 March 2011. 1 2 Cameron Adams (10 June 2010). "Q & A: Richard Ashcroft talks about The Verve and his Australian tour". The Daily Telegraph. Retrieved 13 September 2010. ↑ "This is Music – A Verve History". Musicsaves.org. Retrieved 13 September 2010. ↑ "Bittersweet Triumph". Musicsaves.org. Retrieved 13 September 2010. ↑ "The Verve". Musicsaves.org. 15 May 1995. Retrieved 13 September 2010. ↑ "Interview". Musicsaves.org. Retrieved 13 September 2010. ↑ "Verve A Storm in Heaven – an unofficial site". A Storm in Heaven. Retrieved 13 September 2010. ↑ The-verve.info Archived 28 August 2008 at the Wayback Machine. ↑ "Verve Interview". Musicsaves.org. Retrieved 13 September 2010. ↑ "Dark Star". Musicsaves.org. Retrieved 13 September 2010. ↑ "Follow the Yellow Brick Road". Musicsaves.org. Retrieved 13 September 2010. ↑ "Audio". Illegal-art.org. Retrieved 8 December 2011. ↑ Mike Gee (1 January 1998). "The Verve: Urban Ties; A Bittersweet Symphony". iZine. Archived from the original on 27 August 2006. Retrieved 9 May 2007. ↑ The-verve.info Archived 4 December 2008 at the Wayback Machine. ↑ "The Latest Verve News". Musicsaves.org. Retrieved 13 September 2010. ↑ The-verve.info Archived 19 January 2009 at the Wayback Machine. ↑ "The Verve's bitter sweet career". BBC News. 28 April 1999. Retrieved 23 March 2011. 1 2 "Nick McCabe Interview Part 2 | Excellent Online". Classic.excellentonline.com. 20 September 2002. Retrieved 13 September 2010. ↑ "Richard Ashcroft online". Richard Ashcroft online. Retrieved 13 September 2010. ↑ Alex McCann. "The Shining". Designer Magazine. Retrieved 13 September 2010. ↑ Mark Daniell (8 February 2006). "CANOE – JAM! Music – Artists – Ashcroft, Richard: Ashcroft on new CD, Verve reunion". Jam.canoe.ca. Retrieved 13 September 2010. ↑ "The Verve – Jones: 'It Would Have Been Too Hard To Work With Tong'". Contactmusic.com. 12 September 2008. Retrieved 8 December 2011. ↑ "The Verve reunite for tour". NME. 26 June 2007. Retrieved 8 December 2011. ↑ "The Verve – Verve Turn Down Multi-Album Deal Comeback Offer – Contactmusic News". Contactmusic.com. Retrieved 13 September 2010. ↑ "The Verve Reform". Xfm. Retrieved 8 December 2011. ↑ "The Verve announce new tour dates". NME. 2 October 2007. Retrieved 8 December 2011. ↑ "Coachella 2008 line-up unveiled". NME. 22 January 2008. Retrieved 8 December 2011. ↑ "Radio 3FM – 3FM – Serious Radio". 3fm.nl. Retrieved 8 December 2011. ↑ Oxegen Festival 2008 official website Archived 28 February 2008 at the Wayback Machine. ↑ Eden Project Press Release Archived 7 September 2011 at the Wayback Machine. ↑ "'Zane plays the new Verve single, avail until 30 Jun 08". BBC. Retrieved 8 December 2011. ↑ Cohen, Jonathan. "The Verve Storms Back on Fourth Album". Billboard. 1 August 2008. 1 2 3 Chad. "The Verve Break Up...Again". Alternative Addiction. 15 August 2009. ↑ "Richard Ashcroft – Ashcroft Rules Out Verve Return". Contactmusic.com. 7 July 2010. Retrieved 8 December 2011. ↑ "Richard Ashcroft – Ashcroft will "never say never" to Verve reunion". Hot Press. Retrieved 8 December 2011. ↑ "Moby – Bittersweet Symphony (remix)". Lastfm.it. 11 September 1965. Retrieved 8 December 2011. ↑ "Countdown | Hottest 100 – Of All Time | triple j". Australian Broadcasting Corporation. Retrieved 13 September 2010.